According to stateuniversities.com, the Belhaven Dance department comes in at 16th amongst 100 schools for “Most Popular Schools for a Dance Major or Degree”. This list represents schools from across the nation that possess a general program that prepares individuals to express ideas, feelings and/or inner visions through the performance of one or more of the dance disciplines, including but not limited to ballet, modern, jazz, ethnic, and folk dance, and that focuses on the study and analysis of dance as a cultural phenomenon. These schools also include instruction in technique, choreography, Laban notation, dance history and criticism, and dance production in their programs. Belhaven comes in just behind schools such as New York University (#1), The Ailey School (#5), and Florida State University (#11), though we rank above many of our competitors, such as Temple University (#19), The Julliard School (#33), and the University of Southern Mississippi (#97). The department accepted 31 talented dancers for Fall 2017 enrollment from the auditions held last semester. 18 students and 1 faculty member traveled to the Alabama Dance Festival in January, being invited to present two pieces in the New Works Concert and engage in an audition for prospective students. On February 17, they are hosting an “exchange day” with Ballet Magnificat Trainees, who will share a ballet class with upper level BU dancers and present choreographic works. On Thursday afternoons prior to dance concerts, there will be free Open Dress Rehearsals for dance students from Power APAC, MS School of the Arts, and Hinds Community College to attend. During Spring Break (March 13-17), 21 students and 3 faculty will travel to the American College Dance Association Regional Conference at Auburn University to present 3 dance works as well as take classes and attend performances. For the Spring Dance Concert (March 31, April 7-9), dance students have the opportunity to learn from 3 world-class guest artists who are creating original dance works for the concert. Several dozen outstanding Humanities Division students, faculty members, and professionals from Mississippi’s universities, colleges, and community colleges are honored each year by being named William Winter Scholars at the Natchez Literary and Cinema Celebration. Each is chosen by his or her educational institution as the Humanities Division’s most outstanding student, faculty member, or professional. This aware allows winners to attend most of the NLCC free of charge. The annual award also carries with it prestige and public acknowledgement of how highly the person is regarded by his or her institution. Ms. Emily Wright, Associate Professor of Dance, will be recognized and represent Belhaven at this year’s NLCC. The celebration will take place on February 23-25, with the opening ceremony on Friday, February 24th. Ms. Wright was also given the opportunity to nominate an outstanding student to be recognized alongside her, of whom she chose Catherine Hampton, a junior BFA Dance and English double major. The winners are honored publicly at the opening and closing sessions, in the printed materials, and in publicity. The group is photographed with former Mississippi Governor William F. Winter, after whom the scholarship is named. Winter has served as Director of Proceedings for the Natchez Literary and Cinema Celebration each year since the event began in 1990. The Mississippi Guitar Festival 2016 had a great turn out with around 30 participants coming from as far as California, Texas, Georgia, and Louisiana in addition to Mississippi. 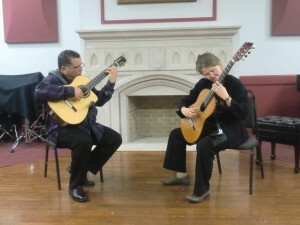 The participants in each category displayed an impressive level of guitar artistry.